An archaeological dig at Castelgard, France, has been benefiting from unusually accurate intelligence by its funder - the technical corporation ITC. When the dig leader, Professor Edward Johnston (Billy Connolly) heads to ITC for answers and fails to return, his team find themselves called in after him. There they discover ITC's most secret project: transmitting human beings via a wormhole from the present day to the Middle Ages. 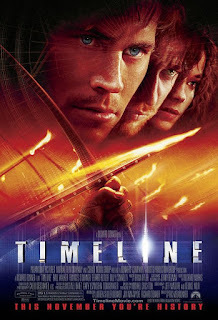 Timeline was a commercial misfire back in 2003, failing to break even and gathering critical reviews that ranged from indifferent to actively hostile. To this day I do not entirely understand why. While there is nothing in the film that leaps out and shows the audience something unprecedented or particularly impressive, it remains a solidly constructed and well-directed science fiction adventure film. Howard Hawks' famous definition of what makes a good film - 'three great scenes, no bad ones' - definitely qualifies here. The film is based on the novel by Michael Crichton and, like his earlier work Jurassic Park and Congo, takes a bit of pop science and crafts it into a populist, easy-to-comprehend action-adventure story. Much like those earlier books it also showcases a team of intelligent and resourceful scientists. That is something I have appreciated about many of Crichton's more famous works: he lets smart, capable men and women be smart and capable, and generally win the day. While Jurassic Park saw a palaeontologist, a palaeobotanist and a mathematician run for their lives around an island full of dinosaurs, so Timeline throws a group of archaeologists into the 14th century and leaves them to sink or swim. It is an interesting feature of Timeline that it does not really have a star. It features a strong and fairly appealing cast, including Connolly, Gerard Butler, Frances O'Connor and Paul Walker, but none of them were big drawcards at the time. Of the four it's arguably only Butler who ever did manage to become an audience attraction in his own right; Walker could never draw a mainstream audience unless he was driving cars alongside Vin Diesel. They are all solid in this film, giving engaging but superficial performances, which actually suits the generally simple, to-the-point style of the film in general. Some of the supporting actors are a lot better, including Michael Sheen as the English Lord Oliver who rules over Castelgard and the perpetually under-utilised and under-rated Neal McDonough as the ITC security chief Frank Gordon. The film takes a very one-sided view of history, with the French portrayed as dignified and noble and the English as cruel, sadistic monsters. While it does suit the film's narrative, it also feels a little simplistic and tedious. Timeline came out at what seemed like a new height of Hollywood using English accents as a shorthand for dastardly villainy. It's pretty far below the industry's high water-mark of English villainy - that would probably be Roland Emmerich's 2000 epic The Patriot - but it still feels a little obvious and unfair. The protagonists are on a tight schedule to find Professor Johnston and return to the 21st century unharmed. Naturally their adventure draws them into the events of 1357, culminating in a night-time siege of Castelgard's castle. It's an effectively staged battle sequence, carefully shot using real weapons and arrows and eschewing computer-generated effects wherever possible. The result is a battle that has a proper weight and realism to it, Director Richard Donner had a long and successful career in Hollywood, directing the likes of The Omen, Superman, The Goonies, Ladyhawke and Lethal Weapon. For me the Battle of Castelgard is his last great piece of filmmaking. He only made one film after this, the underwhelming 16 Blocks, before retiring from directing movies. The bottom line for me is that were Hollywood to improve the general standards of its blockbuster action films, then Timeline is exactly the sort of film that the industry should think of as average. It gets in, it does its job, it tells an entertaining story in the space of two hours and then it gets out without delay. It is a rock-solid movie from an industry workhorse, seemingly as underrated as the film he made.